Helix tracks allow the train to move up and down extending a two-dimensional into three dimensions. Below is information on novel helix designs used with O-guage trains. See photos and information about the SSPRR Run Room Helix. This was my first helix. I bought it at a RMDTCA estate auction in about 1989 for $35. After running trains on it at a lot of train meets I sold it to a TCA member from New Mexico. That TCA member had bid against me at the auction but couldn't take it home with him because he was travelling in a Thunderbird. He was very happy to be able to finally purchase it to run in New Mexico. 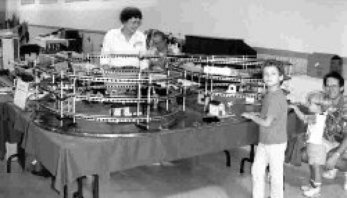 View a slideshow of this compact double-helix that is designed for train shows and allows for the public's interaction with the layout. This unique helix has intertwined spiral loops. A corkscrew design allows the train to move up and down in the same circle. Click here for an example.